If you are looking for the best water purifiers under 15000 then I must say you are at the right place. You will get to see the detailed review also I have noted out the pros and cons of all of these water purifiers. So without wasting any further time let’s begin the list. 3 2. Havells Max 8 litre RO UV water purifier. If you are looking for a reliable water purifier with all the essential features and a solid water purification then Kent Grand Plus is ideal for you. This water purifier comes with RO, UV and UF water purification technologies. Additionally it also comes with TDS controller, which allows a to purify any kind of water. Also this water purifier comes with good additional features such as spin welded RO membrane, SMPS, high power UV bulb and push fit components. Kent Grand Plus comes with a traditional water purifier look. It is a wall mountable water purifier and you can also put it on the table top. Below the filter there is a large water storage tank and water level indicator is also embedded in it. This water purifier comes traditional tap for dispensing water which does its job very well and you will not see any kind of water leakage even after a very long time. This water purifier comes with RO, UV and UF water purification. The first stage of purification is consist of sediment filter which removes suspended sediments as well as physical or visible impurities like sand, mud or dust from the water. This activated carbon filter has an ability to absorb harmful chlorine and chlorine by-products from the water. When the water is treated with chlorine for the purification (Municipal water is usually treated with chlorine for purification) then it forms harmful chlorine and chlorine by-products in the water and this filter removes the same from the water. This filter also removes bad taste and odour causing contaminants as well as volatile organic compounds (VOCs) from the water. The third stage of purification is of ultrafiltration. This stage is consist of UF membrane which has minute pores of 0.01 microns. It removes bacteria and cysts from the water. The Fourth Stage of purification is of RO filtration. This stage is consists of RO membrane which has very minute pores of 0.00001 microns. Water is passed with the great force through this membrane, which removes dissolved solids and solids from the water. Once there are no physical or dissolved impurities in the water, then the water is passed in the UV chamber for the UV purification. This stage is consist of UV bulb. Water is exposed to the UV rays of the usual which inactivates harmful bacteria, viruses and Protozoa from the water. Sixth and the final stage of purification has post carbon filter which adds essential minerals in the water, which makes water not only healthy but also tasty for consumption. Kent Grand Plus also comes with a TDS controller. As the name suggests allows you to control the TDS of the water. Water having TDS between 250 mg / l to 500 mg / l is considered as ideal for consumption. If the TDS limit of the water lowers or exceeds this range then the water is considered as unhealthy for consumption. In Kent Grand Plus. with the help of the TDS controller you can literally set the TDS range as per your wish which is quite convenient. This water purifier will automatically fill the water in the water storage tank when the water level will decrease and it will also automatically stop the filling process once the water storage tank gets fully filled. Kent Grand Plus comes with Spin Welded RO membrane which is damage proof. Usually RO membranes are very delicate and they are costly as well. The spin welded RO membrane of kent Grand Plus will not get easily damage due to physical or visible impurities such as sand, mud, dust etc. Usually water purifiers comes with 8 watt UV bulb but Kent Water purifiers comes with 11 watt UV bulb which are more effective in inactivating harmful bacteria, viruses and protozoa from the water. Kent Grand Plus comes with two LED indicators which will notify you whenever you will have to change its RO membrane or UV bulb. Talking about other filters like sediment filter, activated carbon filter and UF membrane you will have to change them annually. Kent Grand Plus comes with a built-in SMPS which basically works as voltage stabilizer. It will stabilize the high voltage current during voltage fluctuations ensuring that no harm will cause to this water purifier due to such high voltage current. All the components of this water purifier are push fit which basically means that, they are attached to each other in such a way that it will not cause any kind of water leakage. This water purifier comes with a filter change and UV fail alarm which will notify you whenever you will have to change its RO membrane or UV bulb. As far as other filters are concerned like sediment filter, activated carbon filter, post carbon filter and UF membrane you will have to change them annually. Kent wonder comes with 1 year warranty and 3 years of no service charge. Users are very happy with the purification of this water purifier.Some users also found the maintenance of this water purifier quite expensive. If you are looking for reliable water purifier with a solid water purification and all the essential features then Kent Grand Plus is ideal for you. So this water purifier is able to purify any kind of water whether it is soft water like Municipal water or hard water like bore well water. Also it comes with a very good additional features such as built in SMPS which basically works as an voltage stabilizer. Spin welded RO membrane which is damage proof. Hi-Power UV bulb which is very effective in removing harmful bacteria, viruses and protozoa from the water. And push fit components which prevents water leakage. This water purifier does not have a compact design and it will look a bit bulky. You may also found the maintenance of this water purifier a bit expensive. See Detailed Review of Kent Grand Plus. 2. Havells Max 8 litre RO UV water purifier. If you are looking for a water purifier with unique and modern look with a solid water purification technology then Havells Maxx water purifier is ideal for you. This water purifier comes with a RO and UV water purification technologies and it has 8 litre water storage tank. This water purifier comes with a unique design which allows it to fit easily in the conners. It is a wall mountable water purifier. Because of its unique design it really fits well in the corners which saves a lot of space. Also you can mount this water purifier on the flat wall as well. You can also use this water purifier as a table top. It comes with a transparent water storage tank which really adds to its modern look and gives you the confidence that the water you are drinking is pure. The water dispensing tap of this water purifier is also very unique and convenient. This water purifier also comes with Zero Splash Faucet which as the name suggest provides zero splash, hygienic water and smooth water flow. Overall this water purifier has a very solid build quality and it is made from high quality plastic. Havells Max comes with RO and UV water purification technology and it completes its water purification in seven stages. Now let’s have a closer look at each stage, its filters and its working as well. The first stage of purification is consist of sediment cartridge which as the name suggests removes sediments from the water. The second stage of water purification is consist of activated carbon cartridge. It removes bad taste and odour causing contaminants from the water. The third stage of purification has RO membrane. The RO membrane have very minute pores, the water is passed with a great fall through this RO membrane which allows water molecules only to pass through it and blocks all the excess dissolved salts and solids from the water. The Fourth stage of water purification is of UV purification. At this stage the water is exposed to the UV rays of the UV bulb which inactivates harmful bacteria and viruses from the water making the water 100% microbe free. The fifth stage of water purification is consist of mineralz cartridge. The 6th stage of water purification has silver impregnated taste enhancer which as the name suggest enhances the taste of the water. The seventh stage of water purification is of revitalizer cartridge. This cartridge restructures the water molecules and makes it biologically active which basically helps to improve the hydration and the mineral absorption. The water storage tank is made from ABS plastic which is non-toxic and durable as well. The water storage tank is transparent as well. The water storage tank of this water purifier is removable as well so you can easily remove it for cleaning purpose. Havells Max comes with self diagnostic features. It has power and error indicators. It has purification process indicator and tank full indicator. This is a RO water purifier so it requires a decent amount of water pressure for proper working and this water purifier comes with a low water pressure indicator which will notify you whenever the water pressure is low. Besides this water purifier will also notify you in case of UV bulb failure and pump failure. This water purifier comes with electrical protection system which basically protects the water purifier during voltage fluctuations, ensuring its long life. This water purifier comes with 1 year manufacturer warranty. This water purifier comes with a good alert system so it will notify you in case of any filter failure. Overall the design and build quality of havells Max is very good. Also as it is equipped with RO and UV water purification so it can purify any kind of water whether it is municipal water or water from the bore well. Also it has a 7 stage water purification which is consists of very good filters so it has a pretty solid water purification system in place. Additionally, it also comes with voltage fluctuation guard which protects it during voltage fluctuations. Users are also very happy with the performance and design of this water purifier. If you are looking for a stylish water purifier with a good water purification then Blue Star Majesto is ideal for you. This water purifier has a very stylish elegant looks and it comes with RO and UV water purification. Blue Star majesto is made from Food grade plastic which is non-toxic and durable as well. This water purifier has a very elegant and stylish looks. It comes with a traditional water dispensing tap and 2 LED Notification indicators. Out of 2 LEDs, one LED is for the power on / off indicator and the second one is full tank indicator. Overall the build quality of this water purifier is very good. Blue Star majesto comes with RO and UV water purification technologies. Now let’s have a look at its each water purification stage and its filters. The first stage of purification is consist of superfine Pre-sediment filter. This sediment filter has minute pores of 5 microns. It removes visible or physical impurities likes sand, mud, dust as well as suspended particles from the water. It removes bad smell and order causing contaminants as well as volatile organic compounds (VOCs) and bacterias from the water. RO purification comes in at the third stage. This stages consists of RO membrane which has very minute pores. Water is passed with a great force through this membrane which separates heavy metals like mercury, arsenic, lead and pesticides and other dissolved harmful Salts and solids from the water. UV purification comes in at The Fourth Stage. At this stage the water is introduced in the UV chamber where it gets exposed to the UV rays of the UV bulb which inactives harmful bacteria, viruses and protozoa from the water. At the fifth stage, the post carbon filter removes the remaining impurities from the water. The sixth stage is consist of Aqua taste booster which basically adds the essential minerals in the water which makes the water healthy and tasty as well. Blue Star Majesto comes with a water storage tank of 8 litres. Blue Star Majesto comes with a large water purification capacity of 258 litre per day which makes it ideal for any family whether it is small or big family. Blue Star majesto comes with two LED which will which will notify you if the water purifier is running or not and the other LED is the full tank indicator. This water purifier does not comes with a filter change alarm. Blue Star majesto comes with a unique child lock feature at its tap, which basically prevents water wastage. This water purifier does not comes with an auto shut off feature so you will have to shut off the water purifier once the water storage tank gets fully filled, which is quite inconvenient. It will notify you whenever the water storage tank will get fully filled with the LED indicator. This water purifier comes with RO and UV purification. It doesn’t come with a filter change or UV fail alarm. So you will have to change its RO membrane whenever it get damaged or whenever it becomes ineffective. After how much time you will have to change its RO membrane is really depends upon what kind of water it purifies and how much water it purifies. Also you will have to change its UV bulb whenever it get in effective. As far as other filters are concerned likes sediment filter, copper impregnated activated carbon filter and post carbon filter you will have to change the annually. Blue Star Majesto comes with 1 Year Warranty. Users are happy with the stylish look of this water purifier. They also appreciate its water purification as well. This water purifier comes with RO and UV water purification. It also comes with Aqua taste booster which basically adds the essential minerals in the water which makes water healthy and tasty as well. It has a 8 litre water storage tank and a unique child lock feature as well. This water purifier does not comes with auto shut off functioning so you will have to shut off the water purifier once the water storage tank get fully filled with purified water. It will notify you whenever the water storage tank will get fully filled with its LED. Overall Blue Star Majesto has a very good build quality. If you are looking for a RO+UF water purifier with the transparent water storage tank then Kent wonder RO + UF water purifier is ideal for you. This water purifier comes with RO and UF water purification. Additionally it also has a TDS controller. Kent wonder is made from Food grade plastic which is non-toxic and durable as well. You can easily remove it without any help of professionals for cleaning purpose. It comes with two LED indicators as well. Kent wonder comes with RO and UF water purification. It completes its water purification in 5 stages. Now let’s have a look at each of its purification stage and its filters. The first stage of purification is of sediment filter which removes suspended sediments as well as physical or visible impurities from the water like sand, mud, dust etc. The second stage of purification has activated carbon filter which absorbs harmful chlorine and chlorine by-products from the water. If you are getting water from Municipal water supply then this filter is very useful because usually Municipal water is treated with chlorine for the purification which forms harmful chlorine and chloride by products and this filter removes the same. It also removes bad taste and odour causing contaminants as well as volatile organic compounds from the water. Ultrafiltration comes in at the third stage. This page is consist of UF membrane. The membrane has minute pores of 0.01 microns and it removed bacteria and cysts from the water. RO purification comes in at the fourth stage. This stage is consists of RO membrane. The RO membrane has very minute pores. Water is passed with the great force through this membrane which removes harmful dissolved solids and solids as well as heavy metals like arsenic, lead and Mercury from the water. Fifth and the final stages consists of post carbon filter. This filter basically adds essential minerals in the water which may get removed during a RO purification. This page basically makes the water healthy and tasty. Kent wonder does not use any kind of chemicals for the purification ensuring you get 100% chemical free water. TDS controller, as the name suggests, allows you to control the TDS of the water. The TDS of the water between 250 to 500 mg / l is considered as ideal for consumption. With the TDS controller you can set the TDS of the water as per your wish. It basically helps to retain the essential natural minerals in the water. Kent wonder comes with a water storage tank of 7 L, which is made from Food grade plastic which is non-toxic and durable as well. This water purifier comes with an unique transparent water storage tank which is detachable as well, which gives you confidence and its ease of cleaning as well. 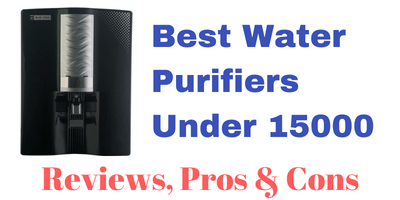 And make it a tough contender of the list of the best water purifiers under 15000. This water purifier will automatically fill the purified water in the water storage tank and it will automatically shuts off the filling process once the water storage tank gets fully filled which is quite convenient. Kent wonder comes with 2 notification LEDs. Out of 2 LEDs, one will show you, the water purifier is running or not and other one will notify you whenever the water purifier will require service. RO membranes are very delicate and they easily get damage. Kent wonder comes with spin welded RO membrane which will not get easily damaged due to physical or visible impurities like sand, mud or dust, ensuring its long life. Kent wonder comes with push fit components which basically means that all the components of this water purifier are attached to each other in such a way that it will not cause any kind of water leakage. Kent wonder comes with a built in SMPS. The SMPS is also considered as energy efficient as well. Kent wonder comes with RO and UF water purification technologies. So it has RO membrane, sediment filter, activated carbon filter, UF membrane and post carbon filter. The service LED will notify you whenever you will have to change its RO membrane. And you will have to change other filters like sediment filter, activated carbon filter, UF membrane and post carbon filter annually. Users are happy with the purification of this water purifier. They also appreciate its transparent and detachable water storage tank. If you are looking for RO water purifier with transparent and detachable water storage tank and a good water purification then Kent wonder RO + UF water purifier is ideal for you. This water purifier comes with a sediment filter, activated carbon filter, RO membrane, UF membrane and post carbon filter. It completes its water purification in five stages. Also it comes with two LED which will notify you about the service and power. Also this water purifier has very helpful features such as spin welded RO membrane which is damage proof. Built in SMPS which basically works as an voltage stabilizer. Push fit components which prevents water leakage. If you are looking for reliable water purifier with a solid water purification then Kent Ace is ideal for you. Kent Ace and Kent Grand Plus are very similar in terms of design and purification as well. Additionally it also comes with a TDS controller as well. This water purifier can purify any kind of water weather it’s a hard water like bore well water or soft water like Municipal water. Kent Ace comes with a very traditional water purifier design. Its design is similar to the Kent Grand Plus accept the filters of this water purifier are fully covered with non transparent cover and also its water storage tank is smaller. It also has a water storage tank and the water level indicator is embedded in the water storage tank. Overall Kent Ace has a very sturdy body. It comes with a sediment filter, activated carbon filter, RO membrane, UF membrane, post carbon filter and UV bulb. The first stage of purification has sediment filter which remove suspended sediments as well as visible or physical impurities like sand, mud or dust etc, making the water clean and clear. The second stage has activated carbon filter which has an ability to absorb harmful chlorine and chlorine by-products from the water. This filter also removes bad taste and odour causing contaminants as well as volatile organic compounds from the water. This stage has UF membrane which has minute course of 0.01 microns and it removes bacteria and cysts from the water. When there are no physical or visible impurities remained in the water then it is passed for RO purification at fourth stage. This stage is consist of RO membrane. The RO membrane has very minute pores. Water is passed with a great force through this RO membrane which removes harmful dissolved solids and solids as well as heavy metals like arsenic, mercury and lead from the water. When there are no dissolved or physical impurities in the water than the water is passed for the UV purification at fifth stage. At this stage the water gets exposed to the UV rays of the UV bulb which inactives harmful bacteria, viruses and protozoa from the water making the water 100% microbe free. Sixth and the final stage of purification has post carbon filter which adds essential minerals in the water which may get removed during RO purification. This stage basically helps to make water healthy as well as tasty by adding essential minerals. TDS controller as the name suggests allows you to control the TDS of the water. The TDS between 250 mg / L to 500 mg / L is acceptable for consumption according to Bureau of Indian Standards (BIS). With the help of the TDS controller you can set the TDS level as per your wish. Kent Ace comes with a water storage tank of 7 litres. It automatically fills the purified water in the water storage tank and once the water storage tank is fully filled then it will automatically shuts off the filling process which is quite convenient. It has a water level indicator equipped with the water storage tank as well. This water purifier comes with a filter change and UV fail alarm which will notify you whenever you will have to change it’s RO membrane or the UV bulb needs to be changed. RO membranes are very delicate. Kent Ace comes with a spin welded RO membrane which is basically damage proof. It will not get easily damaged due to physical are visible impurities likes sand, mud, dust etc. Usually water purifiers are equipped with 8 watt UV bulbs but Kent Ace is equipped with 11 watt UV bulb which is more effective in inactivating harmful bacteria, viruses and protozoa from the water. Kent Ace is also equipped with a built in SMPS which basically works as an voltage stabilizer. It stabilizes high voltage current during voltage fluctuations ensuring that no harm will cause to this water purifier during such voltage fluctuations. Kent Ace is equipped with push fit components which basically means that all the components of this water purifier are attached to each other in such a way that it will not cause any kind of water leakage, which is a relief. Kent Ace comes with RO, UV and UF water purification. It has sediment filter, an activated carbon filter, RO membrane, UF membrane, post carbon filter and UV bulb. This water purifier will notify you whenever you will have to change its RO membrane or UV bulb. Talking about other filter like sediment filter, activated carbon filter, UF membrane and post carbon filter, you will have to change them annually. Kent Ace comes with 1 year warranty and 3 years of no service. Users are very happy with the purification of this water purifier. Some users also found the maintenance cost of this water purifier quite expensive. If you are looking for a reliable water purifier with a solid water purification then Kent Ace is ideal for you. This water purifier is equipped with RO, UV and UF water purification. You can use this water purifier to purify any kind of water whether it is soft water like Municipal water or hard water like bore well water. This water purifier has 7 litre water storage tank and a water level indicator is also embedded in the water storage tank. It has a decent alarm system as well which will notify you whenever you will have to change its RO membrane or UV bulb. This water purifier also comes with a very good additional features like spin welded RO membrane, built in SMPS, high power UV bulb and push fit components. Overall Kent Ace has a very good construction. If you are looking for a compact and elegant water purifier with all the water purification technologies i.e. RO, UV and UF along with a taste enhancer then Livpure Pep Star is ideal for you. This water purifier comes with RO, UV and UF water purification and it also comes with a taste enhancer which allows you to purify any kind of water whether it is soft water like Municipal water or hard water like borewell water. Livpure Pep Star has a very compact and elegant design. It comes with a traditional tap for dispensing water. It comes with a small notification display which will notify you about power on, purification process and full tank. Livpure Pep Star comes with RO, UV and UF water purification. It also comes with taste enhancer. It comes with a sediment filter, pre activated carbon filter, antiscalant cartridge, RO membrane, UV disinfection column and UF cartridge. It completes its water purification in 7 stages. The first stage of purification is consist of sediment filter which removes sediments as well as fine and small impurities from the water. The second stage of purification is consist of Pre activated carbon filter which removes harmful chlorine and chlorine by-products from the water. It also removes bad taste and odour causing contaminants well as pesticides from the water. The third stage of purification has antiscalant cartridge which basically removes salts from the water which may get deposit on the RO membrane. This stage physically helps to improve the purification capacity and also the life of the RO membrane. RO purification comes in at the fourth stage. This page is consist of RO membrane which has many minute pores. Water is passed with a great force through this membrane which removes dissolved salts and solids as well as heavy metals like mercury, arsenic, lead from the water. At this stage the water is introduced in the UV disinfection column where it gets exposed to the UV rays of the UV bulb which inactivates harmful bacteria, viruses and protozoa from the water. The 6th stage of purification is of ultrafiltration which removes remaining impurities from the water like bacteria, cysts etc. The 7th stage of purification is of Taste enhancer which basically adds essential minerals in the water which makes the water healthy as well as tasty for drinking. Livpure Pep Star RO water purifier comes with 7 litre water storage tank. This water purifier is equipped with a small LED Notification display which will show you power on/off, water purification process and full tank indicator. This water purifier does not comes with a filter change or UV bulb change alarm. So you will have to change them periodically or whenever they get damaged or ineffective. The time period for changing the RO membrane is really depends upon what kind of water it purifies and how much water it purifies. Talking about other filters like sediment filter, pre activated carbon filter, antiscalant cartridge and UF cartridge you will have to change them annually. Livpure Pep Star comes with 1 Year Warranty. Users are very happy with the compact and elegant design of this water purifier. They also appreciate all the features that this water purifier offers with a reasonable price. As this water purifier does not comes with a filter change and UV fail alarm many people found this inconvenient. If you are looking for a compact and elegant water purifier with all the water purification technologies i.e. RO, UV and UF and a test enhancer as well then Livpure Pep Star water purifier is ideal for you. This water purifier comes with RO, UV and UF water purification along with a taste enhancer as well which allows you to purify any kind of water whether it is soft water like Municipal water or hard water like bore well water and it all comes in with a very reasonable price. It comes with sediment filter, pre activated carbon filter, antiscalant cartridge, RO membrane, UV bulb and UF cartridge. And it completes its water purification in seven stages. It comes with a 7 litre water storage tank. Also it has a decent alert system but it does not comes with filter change or UV fail alarm which is quite inconvenient. Overall the construction of this water purifier is very good. So these were the best water purifiers under 15000 rupees available in India. I hope you find this list helpful. Let me know if you have any doubts in the comments section below and I will be happy to clear them all.